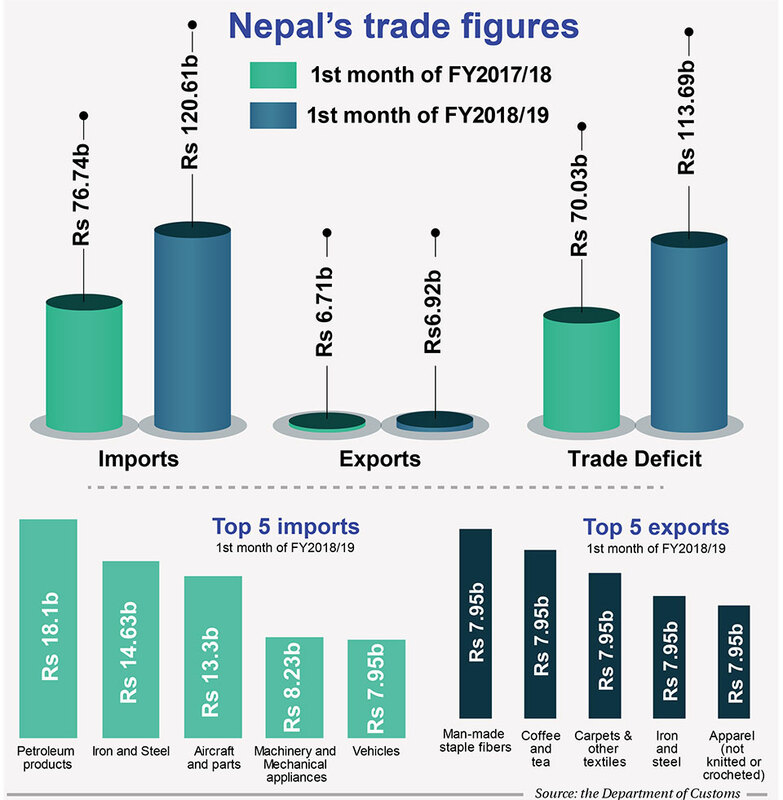 KATHMANDU, Sept 2: Nepal’s total trade deficit rose significantly in the first month of the current Fiscal Year 2018/19 compared to the corresponding period of the last fiscal year. According to the data released by the Department of Customs (DoC) on Thursday, the trade imbalance rose by a whopping 62.35 percent to Rs 113.69 billion between mid-July and mid-August of the current fiscal year from Rs 70.03 billion in the corresponding period of the Fiscal Year 2017/18, amid skyrocketing imports and crawling exports. The exports this year inched up only 3.19 percent in the review month, while the imports rose 57.18 percent. The country exported merchandise goods worth Rs 6.92 billion during the period against imports worth Rs 120.61 billion. The exports and imports figures had stood at Rs 6.7 billion and Rs 76.74 billion, respectively, in the first month of the last fiscal year. Now, Nepal has the imports to exports ratio of 17:4, which means that the country imported goods amounting Rs 17.4 for every rupee worth of goods exported. According to the DoC, high growth of import compared to export this year is due to low volume of trade last year in some custom points in the tarai region of the country that were hit by floods and inundation. The data shows that there has been significant jump in the imports of aircraft and parts, petroleum products, iron, and steel in the current fiscal year. These three commodities alone accounted for higher than one thirds of the total import bill of the country. According to the data, the country imported aircraft and parts worth Rs 13.3 billion in the first month of the current fiscal year, a steep rise from Rs 1.44 billion of the corresponding period last fiscal year. The import of petroleum products also jumped 87 percent to Rs 18.1 billion in the review period. Similarly, the import bill of iron and steel increased to Rs 14.62 billion in the period from Rs 8.63 billion of the last year. If these three products are excluded from the import list, the total import stands at Rs 75 billion, which is a jump by 32 percent from last year’s 57 billion in the review period. Out of the 103 trade partners including 102 countries and one ‘not specified’, Nepal has trade surplus with only 15 countries, according to the data. Nepal’s trade deficit is highest with India followed by China, France and the United Arab Emirates. The trade deficit with the southern neighbor stood at Rs 67.02 billion while the figure with the northern neighbor was Rs 14.85 billion. With France and the UAE, the trade deficit was Rs 12.74 billion and Rs 2.18 billion, respectively.